Okay, mums who are reading this. Do you or do you not have a baby who drives you crazy, up the wall and back, wanting something to eat every single hour of the summer vacation? Anything that doesn't cause obesity or diabetes in the first 10 years of life? No. Chocolate cupcakes? OMG Yes you're the best. I too have one of these in my home. Except this child here, is not a child. But a fully grown man. More specifically, he's the brand new permanent roommate of mine, R.
When an extended weekend comes a-knocking, I literally panic. I need to have something ready at home, that will be a ready munch. Something healthy, but enough to soothe that sweet tooth at 11:30 am and 4 pm (and 4:30 pm and 6 pm and 7 pm). Something with texture. Something that may just satiate for the next 15 minutes. Look no further than these. What I have titled Dark Knight Cupcakes. 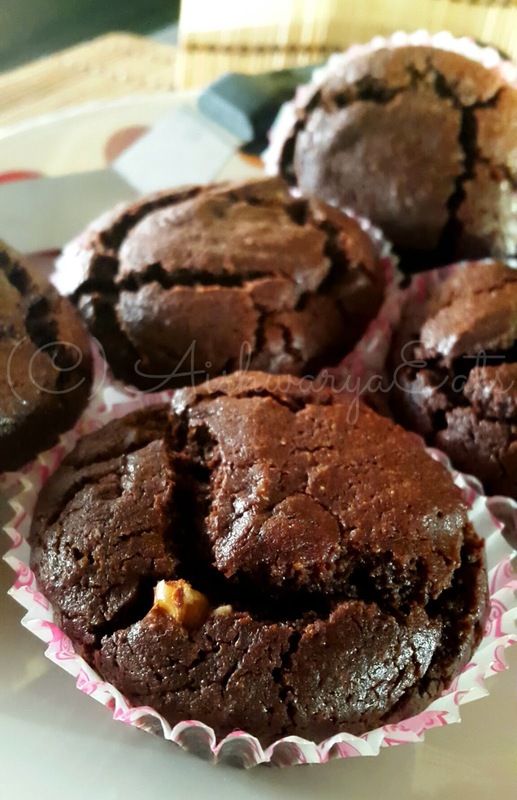 Eggless Whole Wheat Double Dark Chocolate Walnut Cupcakes. They're chocolatey, depending on two sources of chocolatey goodness. Hershey's Cocoa and half a bar of dark cooking chocolate melted. I had to stop myself from licking that bowl clean, chucking the idea of Double Chocolate and just making Single Chocolate Cupcakes. Ya know what I mean? These are stuffed with chopped walnuts. I prefer walnuts for multiple reasons. Firstly, I think lightly toasted walnuts are a fantastic complement for dark chocolate. Toasting the walnuts gets a slight woodsy aroma out that just gels with the dark chocolate. Secondly, walnuts are healthy. Like healthy healthy. One ounce, that's 28g of walnuts provides a solid 18g of good fats for the body, that's 2.5g of Monounsaturated fats (MUFA), 2.5g of alpha-linolenic acid, which is a plant-based omega-3 and 13g of Polyunsaturated fats (PUFA). Usually omega-3 fats are abundant in fish etc. But what of vegetarians? Yeah, this! I try to add walnuts in as many things as I can, maybe a chicken salad, maybe granola bars, and maybe this. Walnuts are also very much effective in curbing and receding diabetes, what with risk factors going through the roof for all ages. A handful of walnuts, chopped. Preheat your convection oven to 180 celsius. Keep your cupcake pan prepared with liners ready, or grease the cups if not using liners. Chop the chocolate into small bits. Please don't be like me and take it out of the fridge 3 minutes before you have to chop it. It will be hell! Keep it out for a while before you have to chop it. In the end you should have 3/4 cup chocolate. Melt the chocolate with 2 tbsp milk in the microwave, in short 10 sec intervals. Mix well when melted. Keep aside. Lightly toast the walnuts if you want. You can definitely keep it raw too. Mix the milk + vanilla with the chocolate first. Add the oil into this. Blend it well. Add half the dry mix into this 2 tbsp at a time. Half way through, add the walnuts. Spare some if you want to top the cupcakes off. Add the rest of the dry mix. Mix enough to avoid lumps, but DO NOT over mix. Spoon the mix into the liners, just 3/4 of the way. Top with the remaining walnuts. Bake for 20 minutes at 180 celsius. Or it depends from oven to oven. Basically bake till 15 minutes, test with a toothpick and complete accordingly. Super chocolatey cupcakes, that actually have stuff that's good for you. Such a great snack, or something to chuck into the lunch box as a treat. This post has been sponsored by the California Walnut Commission.